Ten of the biggest new games to hit the App Store. Without further ado, here's our weekly round-up of the best new games to hit the App Store this week. "Celebrating the Bravoman 25th anniversary, Bravoman: Binja Bash! is a new side-scrolling game for your iPhone, iPad, and iPod Touch that has classic arcade game sensibilities never before seen on the go!" "Once upon a time, a scientist created a machine to make jelly. But once the machine was built, there was an explosion and now a strange goo is pouring into the whole house. Luckily for him, his experimental creatures turned out to love the taste, and thus he discovered a solution..."
"Put your finger flicking skills to the ultimate test and kick for glory in the all new Flick Kick Field Goal 2014! Show team spirit by choosing your favorite College, City and side in the Daily Debate and compete in the daily head to head matchups." "Compete against boxers from all over the world each with their own distinctive style of fighting. Unload on your opponent with jabs, straight punches, hooks and body shots before finishing them off with super combos." "On a starry night, the adorable little Peablins are woken up by a blazing ball of fire crashing into the far corner of Whispering Woods. What could it be? Join the Peablins, solve cuddly puzzles and find out!" "Welcome to Junk Jack X! It is a 2D sandbox where you can explore, build and survive in randomly generated procedural worlds, full of monsters, hidden treasures and beautiful landscapes, now even in multiplayer with friends!" "A daring experiment went out of control, and so Dr. Steven Schrodinstein created the Slugs. Help him getting rid of them before they infest all his house!" "Max Steel: Rise of Elementor puts you in control of the ultimate Turbo team-up. This extraordinary mash-up mixes a rad running game with mind-blowing combat and boss battles to deliver MAX-imum action!" "The critically-acclaimed, best-selling indie sandbox adventure has finally arrived on iOS! 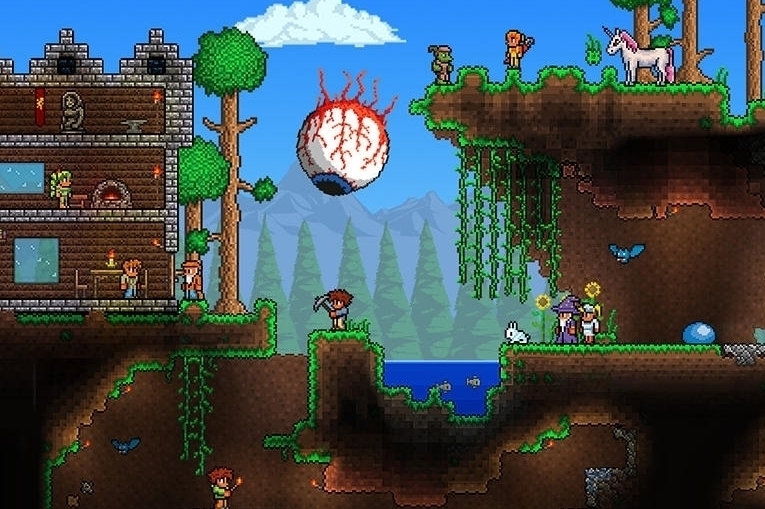 In Terraria, every world is unique, from the floating islands in the sky to the deepest level of The Underworld. Adventure to the ends of the earth, and defeat villainous bosses along the way. The world is your canvas!" "Enter the Yu-Gi-Oh! universe with the fast and fun spin-off Yu-Gi-Oh! BAM. This online Trading Card Game (TCG) features intuitive rules and an addictive gameplay, making it easy to progress through levels., Beware - it will take strategy, skill, and luck to become a true BAM master!"